Knight Models have come a long way quite fast. The majority of the entire 35mm scale Star Wars models I reviewed almost 3 years ago now are all sold out. That put them on the map for sure. 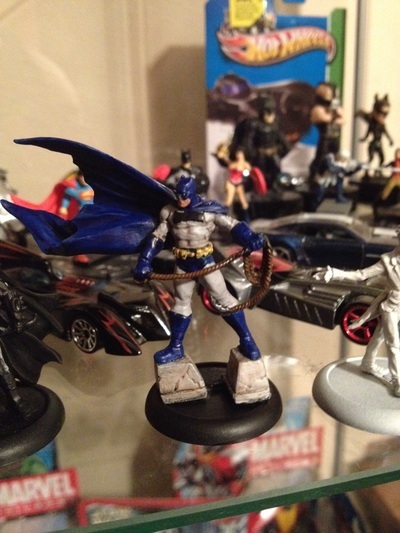 However, the Batman Miniatures Game they've created, and the entire line of models for it are what is really gaining them notoriety with comic-book enthusiasts and skirmish gamers alike. Many are based on Batman Arkham City, but as of just a few days ago they announced some Batman Arkham Origins models are on the way too. I've long had my eye on these models, and quite frankly, they're one of the reasons I dove headfirst back into the miniatures modeling hobby. 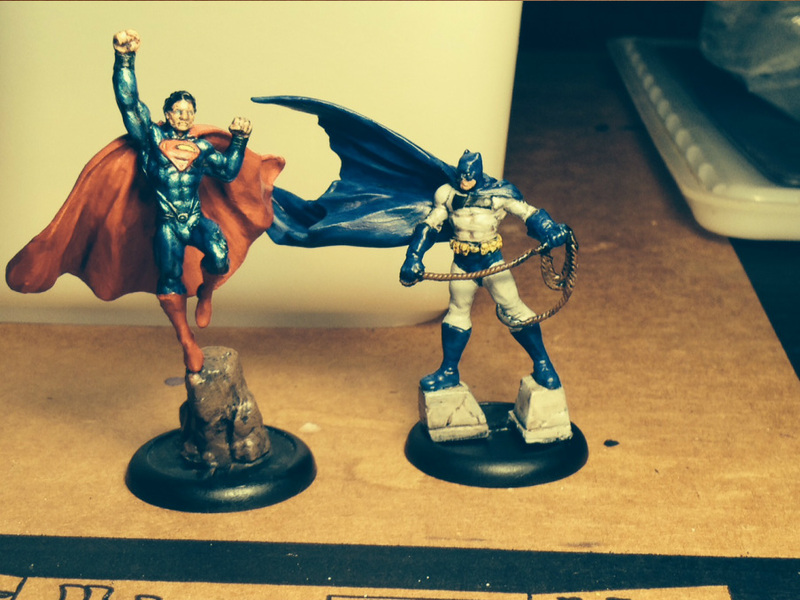 Two of the first models I picked up are Man of Steel and Frank Miller Batman. Each model costs about $20 retail. I believe the MSRP is somewhere around $25 each for the majority of the models, and some of the larger ones can be as high as $50 MSRP, but even those I've found for $35 or less. I snagged Man of Steel from eBay for $22 delivered, and Frank Miller Batman for $17.99 from MiniatureMarket. Man of Steel is based on Superman as seen in the recent feature film with the same name (Man of Steel). It's a 4-piece model. 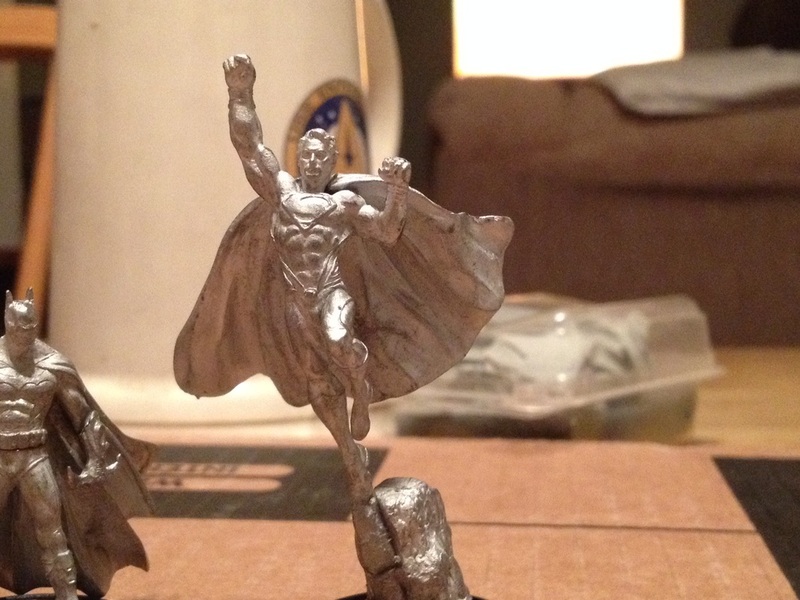 The cape, his left leg, the giant rock somewhat scenic base and his body make up what you'll find in the package. Assembly wasn't hard at all. I did end up pinning his right foot piece into the scenic rock base piece, because it didn't seem like it was going to stay put very well unless I did. Also placing him on the base required a little balancing act. He's a little top heavy once you have the cape in place. As for mold lines and flash... he cleaned up quite well, and I didn't find anything out of the ordinary in that department. A simple hobby knife and my flat file is all I needed to clean him up and have him ready for primer. I did end up stripping him once, because I wasn't pleased with my color choice to begin with, but I'm glad I did it, because the blue metallic paint I ended up using really stands out and looks a lot like the Man of Steel costume from the film. It's far nicer than the average flat blues I've seen others use. 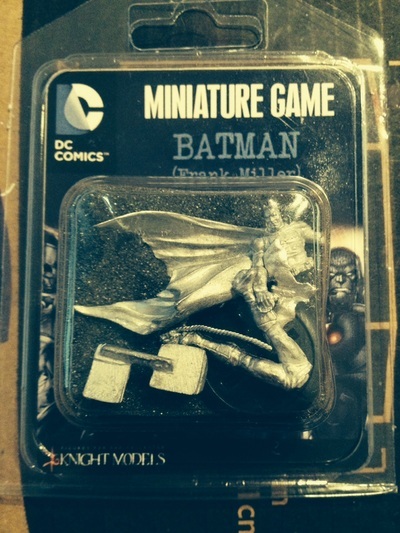 Also this model didn't come with a card to use this piece in the Batman Miniatures game. This was a must have model, more so since I'm a comic-book and longtime Batman enthusiast. He came as only 6 pieces. 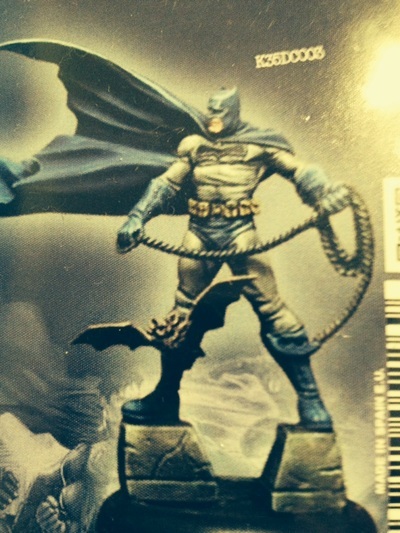 The upper body with cape molded on, lower body, a bat, hand with rope and the somewhat scenic base bit that resembles rooftop stone bits. Once again cleanup and assemble didn't pose any problems. The mold lines and flash was quite minimal overall. The rope and gluing it in place was a little tricky, as it is quite a fiddly-bit, but in end I managed to get it together in no time. Also there's no place that seems clearly defined to place the bat that came with this model. I looked at that picture over and over again, and I couldn't find a spot on his leg to even glue it on. So I left it out altogether. From what I've seen online, most people don't even use it, probably due to the fact there seems to be no defined place to put it. Color-wise I stuck with the traditional color scheme of blue and grey, and I feel he came out quite nice. Detail-wise I think he could have been sculpted with a wee bit more facial detail, that aside he's a phenomenal piece. This model also does come with a card to use it in the Batman Miniatures Game. 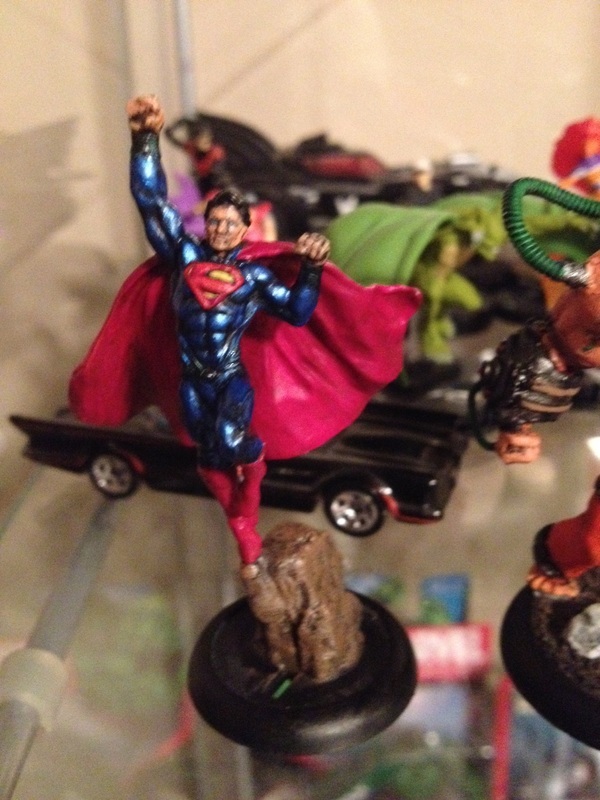 The Man Of Steel is a really nice model, and outside of HeroClix you really can't get a nice 35mm model of Superman anywhere else. 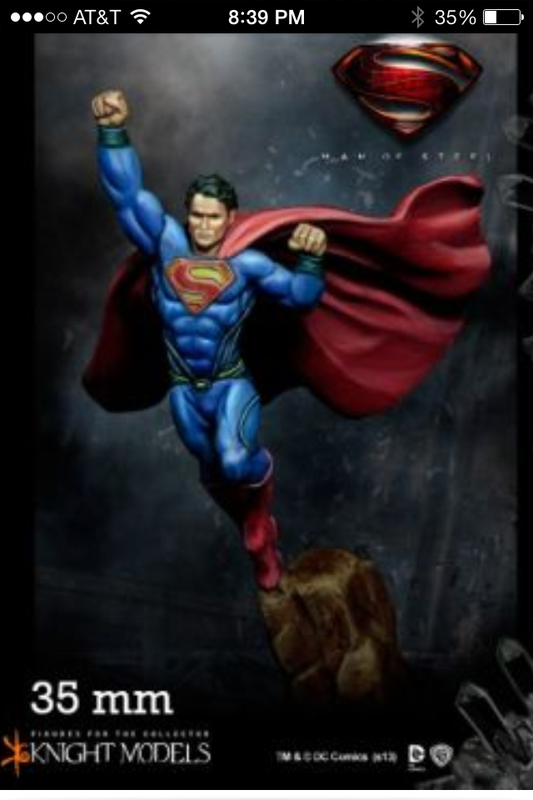 I like this rendition a lot, but I really hope they decide to sculpt up and offer a traditional Superman model as well at some point. This Dark Knight model (which is what they really should have called this) is quite nice as well, and aside from lacking a little more facial detail, and offering no place clearly visible to put the bat...I really can't find any other fault with it. The cape flows nicely, and it's a really nice dramatic pose. I really like these models so far. I think they're priced reasonably well considering they are licensed characters, and the rules for the game itself are free to download in .pdf format direct from their website too. What's not to like? Overall these models have been taking up a lot of my hobby time recently. These were the first two I decided to work on, but there's a lot more on my bench where those came from. So stay tuned for more reviews of these Knight Models pieces in the near future.